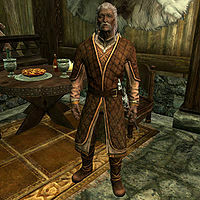 Vignar Gray-Mane is an aging Nord and former Companion, living in Jorrvaskr in Whiterun. He is the patron of Clan Gray-Mane, one of the two oldest families in Whiterun, the other being Clan Battle-Born. He is the brother of Eorlund Gray-Mane and uncle to his children. He is a staunch supporter of the Stormcloaks, and will become the new Jarl should they conquer the city. He is obviously wealthy and wears the attire to show it, a set of fine clothes with matching boots. He carries a Skyforge steel sword, a spare belted tunic, and a selection of upper-class items and gold. He is frequently accompanied by his servant Brill, whom he allegedly helped to rehabilitate from a self-destructive lifestyle. 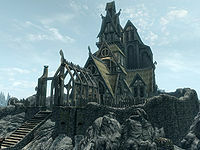 As Vignar is still an honorary member of the Companions, he shares a room with Brill on the ground floor of Jorrvaskr and sleeps there every night between 1am and 8am. He spends most of the day wandering around the famous mead hall, at times taking random meals or talking to the other Companions. At 3pm he heads outside and patrols Whiterun, keeping a steady eye on his rival Olfrid Battle-Born. At 7pm he enters the Drunken Huntsman where he stays until his bedtime at 1am. There are two small exceptions to this daily routine. The first is when you first enter Whiterun and Jorrvaskr, where you will find Vignar as part of the crowd cheering at the sparring session between Njada Stonearm and Athis. The second is when Kodlak Whitemane dies; Vignar will participate in the funeral near the Skyforge. The ongoing feud between the Gray-Manes and Battle-Borns obviously started with the civil war. When approached, Vignar will angrily tell you about his political beliefs: "When the Empire surrendered to the Aldmeri Dominion, they shamed us all! ", "For thirty years, I served the Legion as a commander. Fought in the Great War." and "We Gray-Manes have been feuding with the Battle-Borns for years. There's no more bitter enemy than an old friend." When asked to elaborate on the Gray-Manes, he will explain: "We've got an old saying -- the Gray-Manes have lived in Whiterun since the first snows fell in Skyrim. Well, maybe that's not entirely true, but our clan's got a long an' proud history in this hold. We respect the old ways, the Nord ways, an' a Gray-Mane has worked the Skyforge since before the time of my grandfather's father." On the Battle-Born family, he will bitterly observe: "Aye, they're an old clan like ours, but they cast their lot with the Empire when the uprising began. Olfrid Battle-Born made his money from farming, an' got himself some new friends among the Empire's nobles. Now he's in the Emperor's pocket like the rest of 'em, with no regard for honor an' tradition." He will also tell about the old days, when the clans got along: "Aye, we used to be fast friends, though it was long ago. We were two of the city's oldest an' most-respected clans, an' we could trace our histories all the way back to Ysgramor's companions. But then Olfrid got rich an' decided he an his kin were too good for us simple, backwards Nord folk. When the troubles began, he took the Empire's side. We haven't spoken much since then." Even if most of the younger Companions make fun of his age and lack of memory, Vignar still maintains the attitude of a warrior and can be quite patronizing in his greetings: "You're lookin' at a real warrior! At least I used to be." and "Look at you! Betcha think you're something, huh?" When asked why he joined the Companions he will try to remember: "When you get to be my age, you don't remember why you did much of anything. Only that it happened." Before you start Take Up Arms he will also provide his honest opinion on the decline of the Companions: "They used to be something. Nowadays they just squabble amongst themselves. Take my advice and keep away. You look too smart to get caught up with this bunch." He will also briefly explain what it means to be part of the band: "My advice? Don't overthink it. Fight well and the rest takes care of itself." When he sits around in the mead hall watching the sparring session between Njada and Athis he will spontaneously yell: "Chop chop! ", "Get him! ", "Get in there and push! ", "Look at the young ones scrap! ", "Twelve septims on the girl! Look at that speed." and "Always good to see 'em go." Additionally, when Skjor dies, he will provide his opinion on the tragedy: "Tragic, of course. But, well. Fires go out. Others ignite. Skjor inspired many with his life. Perhaps his death can continue to inspire." "That's just you getting skinnier every day, old man." Vignar: "You ain't made me that stew in a long time." Brill: "Which, the mutton or the vegetable?" Brill: "Hmm. So I haven't. All right, I'll buy the ingredients tomorrow and we can have it for dinner." Brill: "Fancy a game of Iron Hearts later?" Vignar: "You going to lose horribly, and then say you let me win?" Vignar: "There's a chill in the air. Ysmir's beard, it gets colder in here every day." Brill: "That's just you getting skinnier every day, old man. You're losing your padding. You need to eat more." Vignar: "Well if my layabout manservant fed me more, that wouldn't be a problem." Brill: "Oho! Manservant? Is that what I am now?" Vignar: "My mistake. A manservant wouldn't let me starve or freeze. I let you live here, and now I'm two steps closer to the grave." Brill: "Old man, without me, you would have withered away a long time ago." Vignar: "Hmph. Damn you for being right." "Whiterun once again belongs to its rightful heirs." Balgruuf: "This isn't over. You hear me you old fool! This isn't over! And you. A Stormcloak? I'd thought better of you. You'll all come to regret this day." 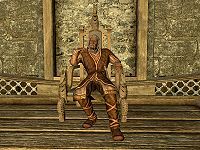 After the heated debate with Balgruuf, Vignar will sit down at his new throne, saying nothing but a victorious: "They will sing stories of this day." As soon as you have reported back to Ulfric Stormcloak, Vignar will officially be the new Jarl, with a few new greetings: "Whiterun once again belongs to its rightful heirs. It's a glorious day for Skyrim." and "The people saw fit to name me Jarl, and I don't intend to let them down." He will also readily tell you about his plans for Whiterun: "Well, first an' foremost there's repairs to make an' wounds to heal. Folks are depending on us getting the city back in working order. Once things settle down, I'll be lookin' to recruit more guards for the city, then shore up our stores of food an' water. The Empire might try an take the city back, or worse, we'll get a visit from a dragon. We've got to be ready for both." He also plans to restore the worship of Talos: "Aye, with a certainty. It was Talos that helped us win back the city. I'm as sure of that as the sun rising in the morning. Might even build a new temple and put Heimskr in charge of it. Hah! I bet he'd like that." "Now, what's this nonsense about trapping a dragon in my palace?" "It's only hopeless if we give up." "I'm Dragonborn. It's my destiny to stop him." "Maybe so, but I plan to go down fighting. What about you?" "Spoken like a true Nord. I'll stand beside you, Dragonborn. Now, what's this nonsense about trapping a dragon in my palace?" Due to his skepticism, you will have no choice but to tell him that it is up to him to stop Alduin. His response will depend on your progress in the civil war quest line. 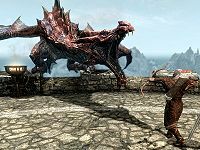 If you have yet to complete it, he will be quite hesitant, as Whiterun will be vulnerable to enemy attacks: "I want to help you, Dragonborn. And I will. But I need your help first. What do you think the Imperials would be doing while this dragon is busy slaughtering my men? No. I can't risk weakening the city while we are under the threat of enemy attack. I'm sorry." 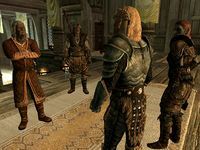 You will then have to come up with a plan to make both the Imperials and Stormcloaks agree to a temporary truce, starting the quest Season Unending: "Then I would be glad to help you with your mad dragon-trapping scheme. But getting both sides to agree to a truce will be difficult at this point. The bitterness has gone too deep. Maybe... hmm... what of the Greybeards? They are respected by all Nords. High Hrothgar is neutral territory. If the Greybeards were willing to host a peace council... then maybe Ulfric and Tullius would have to listen." When you promise to convince the Greybeards, he will bid you farewell with: "Aye, Dragonborn. Maybe you can stop the dragons - and this war into the bargain." When you ask him if Dragonsreach was actually built to capture a dragon he will refer to the skull above the throne and tell the tale: "According to legend. Although I never thought to put the tale to the test. Jarl Olaf One-Eye it was, who later became High King. They say he Shouted it into submission in single combat atop Mount Anthor and brought it back to Whiterun. Numinex was the dragon's name. That's his skull decorating the main hall." Also, if you try to make him set up the trap before the peace council, he will remind you: "My men will be ready when you are, Dragonborn. You have a truce to arrange first, eh?" Tullius: "Riften must be returned to Imperial control. That's our price for agreeing to a truce." Vignar: "Elisif, are you really going to be a party to this foolishness? Do you really think Ulfric will just turn Riften over because some Imperial general barked an order?" Ulfric: "That's quite an opening demand, Tullius." Vignar: "Ulfric, you can't be taking this demand seriously? We can hold Riften against anything the Empire can throw at it. Besides, Jarl Laila will never agree to..."
Ulfric: "Vignar. We will do whatever I decide is in the best interests of Skyrim. Are we clear?" 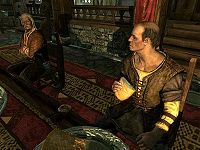 If the negotiations favor the Stormcloaks, Tullius and his allies will leave the table and Vignar will make a comment to you depending on the outcome: "Giving up Riften is a heavy price to pay for this truce, Dragonborn. I hope it was worth it. ", "This is quite an achievement, Dragonborn. And Jarl Ulfric. Markarth is ours!" and "I admit, I really didn't expect these talks to succeed. Getting the Empire to agree to anything at all is quite an achievement." Arngeir: "Jarl Vignar, I assume you are familiar with the Dragonborn's plan?" Vignar: "Yes, I'm ready to do my part. Just say the word, and my men will help you spring this trap." After the lengthy explanation by Esbern, Vignar will leave the table and High Hrothgar, walking all the way back to Whiterun, determined to keep his word: "When I return to Whiterun, I'll get my men ready to help trap this dragon." "Steady now! We need to bring it down!" After the negotiations in High Hrothgar, or If the civil war is already over, he will only think twice before agreeing: "Then... Whiterun will stand with you, Dragonborn. We will take the risk, and gain the glory, whether it be in victory or defeat! So what's the plan, then? How do you intend to lure a dragon into the trap?" When you tell him you don't know anything yet, he will say: "Oh... well, I'll leave that to you. I trust you know your business. Probably for the best. It will give me time to see if that old trap still works - and break the news to the men." Asking him again will net you: "We'll be ready, don't worry. You do have a plan for actually luring a dragon into this trap, don't you?" When you have learned the shout to call Odahviing he will say: "As I promised, my men stand ready. The great chains are oiled. We wait on your word." When you give the order he will respond, "My men know what to do. Make sure you do your part. I'm putting my city in your hands." and walk all the way up to the great porch and position himself on the balcony, waiting for your next move: "Let's do this. Summon this dragon of yours." and "We're ready when you are." When Odahviing finally appears, a hunting bow and twelve steel arrows will be added to Vignar's inventory and he will do his best to help get the dragon to land, while barking out orders: "Hold your fire until he's close! ", "Steady now! We need to bring it down!" and "Keep under cover until it's down!" When the dragon lands, he will shout: "Get back! Get back! We need to trap it, not kill it!" and "That's it! Now, wait until he's well inside!" When the trap is released, a victorious Vignar will yell: "Got him!" and position himself near the entrance, waiting for you to interrogate Odahviing. When the quest ends and The World-Eater's Eyrie begins, an impressed Vignar will greet you with: "I'm still amazed that your plan worked." or "You'll be the toast of Whiterun for this!" He will, however, be very annoyed when castle wizard Farengar Secret-Fire appears and tries to take samples from the trapped dragon: "Farengar! Enough, fool!" When you ask the guard to release the dragon, he will back you up: "Carry on, soldier. This is all part of the Dragonborn's plan." Lastly, before you take off, he will carefully approach the dragon. As you fly towards Skuldafn he will shout: "May Kynareth guard you while you pass through her realm!" He is called Vignar the Revered by the Companions and some of the citizens of Whiterun. He has a package that would exile him to Viola Giordano's house in Windhelm should the Empire retake Whiterun. Brill, Olfina and her brother Avulstein also have this package. Since it is impossible for this to happen, the package is never used.